The purpose of the Erik Plush Project is to raise awareness of literature in general and the works of Gaston Leroux in particular. In the time since Gaston Leroux first published his novel Le Fantôme de l'Opéra, (The Phantom of the Opera) it has been the inspiration for a number of movies, stage plays, and other books, but the original is often unheard of, even to those who believe themselves to be great fans. Both of the creators of the Erik Plush Project possess degrees in language. We believe that the book is almost always better than the movie. If you have not yet read The Phantom of the Opera by Gaston Leroux, we encourage you to become acquainted with it now. Additionally, while The Phantom of the Opera is Leroux's most well known work in America, he is the author of several other novels including Le mystère de la chambre jaune (The mystery of the yellow room) and Le parfum de la dame en noir (The Perfume of the Lady in Black). Check out one of Monsieur Leroux's books today! In the meantime, we at Six Point Design are pleased to present for the first time ever as a plush toy, Leroux's original Opera ghost, Erik. It's a very limited edition, with only 250 being made. You can pre-order yours now, and they'll be shipped out around the end of November. I believe the price for the plushie is about $24.95 + about $3 shipping US/about $10 international. I hate to admit this, but I'm over 50 years old and I've talked my mother into buying me one for Christmas! Gotta love it! A weird mixture of cute and creepy, just the kind of Erik I like... Ha-ha! How can anyone resist a cute and creepy Lerik! I just told my dad I want one. He rolled his eyes. Are there any left? I'm sorely tempted...but also pretty broke... He looks lovely. I especially love the fact he comes with a black mask. While it apparently wasn't a large production run, I believe there are still a number left. I ordered one about a week ago and eagerly anticipate it's arrival. Raphael wrote: While it apparently wasn't a large production run, I believe there are still a number left. I ordered one about a week ago and eagerly anticipate it's arrival. Good. It's near the top of my Christmas list this year. That Leroux!Erik plushie is really quite precious (and no, not in the way that Raphael talks about his PonR Apple, lol). Haven't decided if I'm going to get one or not, but it is really nice to see Leroux's Erik getting some lovable representation. Gosh! I only wish i had one! 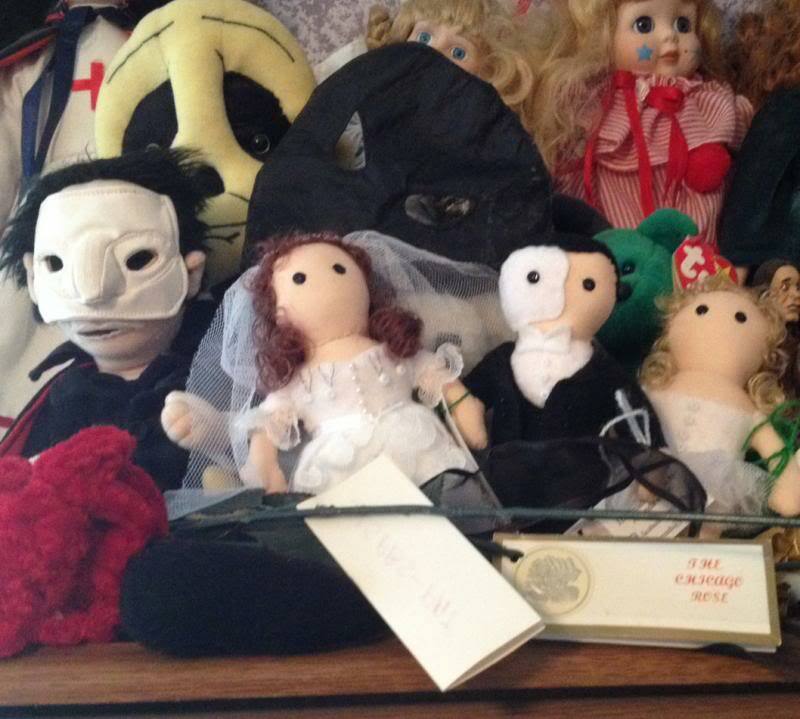 Madame Giry wrote: That Leroux!Erik plushie is really quite precious (and no, not in the way that Raphael talks about his PonR Apple, lol). Haven't decided if I'm going to get one or not, but it is really nice to see Leroux's Erik getting some lovable representation. I took Lil' Erik (as I've dubbed him) along with me on vacation last month. I took more pictures of him seeing the sights than I did of myself! I showed the photo of the plushie to my hubby and he said, "It's kinda cute in a hideous little way..."
I patted his cheek and said, "Just like you, baby." PhantomAngel777 wrote: I showed the photo of the plushie to my hubby and he said, "It's kinda cute in a hideous little way..."
And Raphael, I think you're my new hero. I still need to get one... Somehow, there wasn't one under the Christmas tree this past year. phantomphan1992 wrote: And Raphael, I think you're my new hero. I am very tempted to get one but I keep getting indecisive. Are they still available? Scorp, I think there are about 100 left in stock.